Oh hai! Yours truly popped up on the Scientific American blog last week in a little interview. Thank you, Claire Cusick, for the interview. It was great fun! Okay, I’ll admit it. I’m utterly disgusted with Spring. It’s bad enough that we suffered the driest March on record (i.e. no awesome spring snowstorm tracks), but that April thinks it’s May, short-changing us another month of proper spring storms. 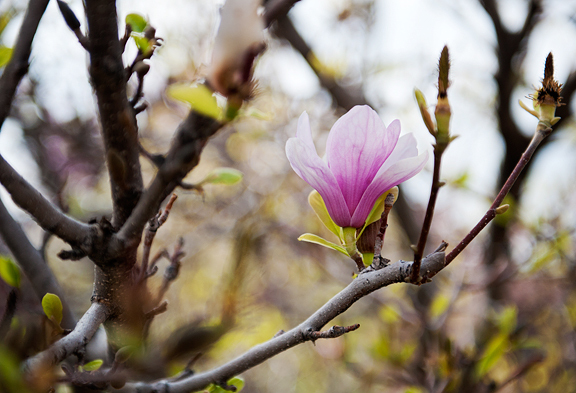 Much in the way undergraduates are far too eager to bare all at the slightest sign of Spring, so too the flower blossoms down in Boulder. We were supposed to get a big dump this weekend – an upslope event dropping up to a couple of feet on my head. I could hardly contain my excitement. Then Friday, the meteorologists were all “ix nay on the snowfall totals”. We went from expecting 2 feet to maybe getting 3 inches, if we were lucky. 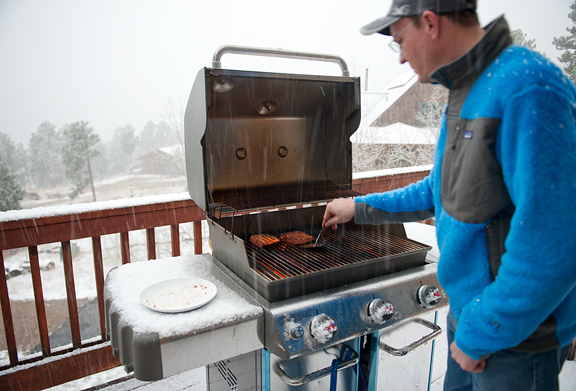 I guess we were lucky, because Saturday night the snow really started to come down, right around dinner time. But it wasn’t meant to be. We planned on a ski tour and wound up hiking instead. 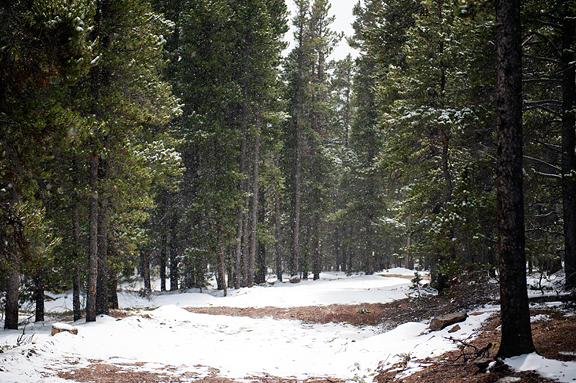 Familiar patches of dirt, mud, and forest understory looked like gaping holes in a ratty blanket of snow. I guess this is it. And even though I truly love all of the seasons, I’m a tad miffed at Summer for being such a pushy stupidhead. There, I said it. I can deal with summer, I just don’t want to deal with summer for half of the year. If that were the case, I’d still be living in Southern California with its seasons: hot and hotter. Before this itty bitty storm, we had a string of warm, sunny days. I know most people outside of Colorado think “snow” when they think of Colorado, but that’s only half of the awesome. Colorado gets 300 days of sunshine a year. That’s a lot. That’s why Colorado kicks your state in the ‘nads. Ha ha ha! I’m kidding! Okay, not really. But warm weather makes me crave fruit, slushies, sandwiches, sushi, and salads. Funny thing is, my old recipes (from like 2 decades ago) are kind of dull compared to how I cook now. So I updated the salad with cilantro, mint, and lemongrass which adds so much more flavor and dimension to the entire dish. And because I had run out of vegetable oil, I brushed butter on the shrimp before grilling it. I worried that the butter might not play well with the fish sauce, lime juice, and other flavors – but it’s a nice touch. 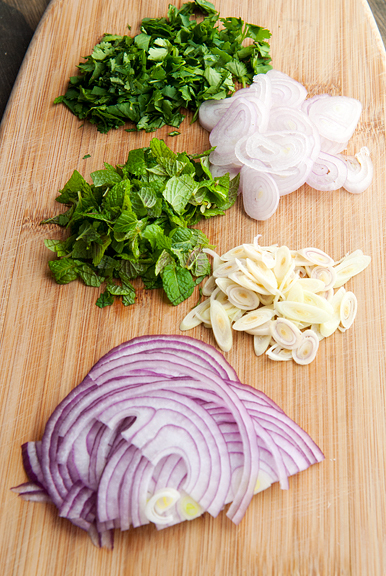 As with the majority of Asian recipes I make, the bulk of the time is spent on preparing the ingredients. Once everything is ready, it takes seconds to assemble. 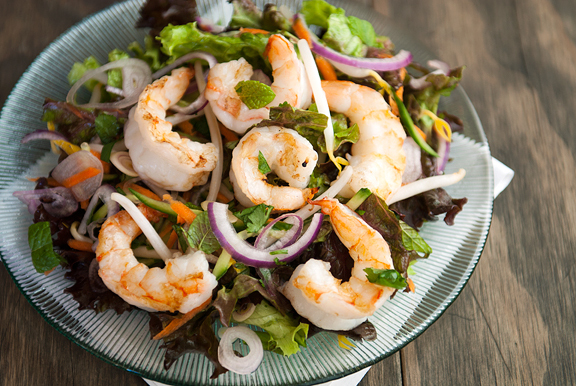 If you want to entertain with this salad, it’s easy enough to make everything ahead, then assemble the salad and cook the shrimp right before serving. I personally like to butterfly the shrimp so that they curl up like flowers when cooked. I recommend adding half of the dressing to the vegetables first. Give the salad a good toss and then taste a piece of lettuce. If the dressing isn’t strong enough, add more until you’re satisfied with the strength of the flavor. And try to let the dressing cool completely or else a warm or hot dressing will wilt the vegetables. 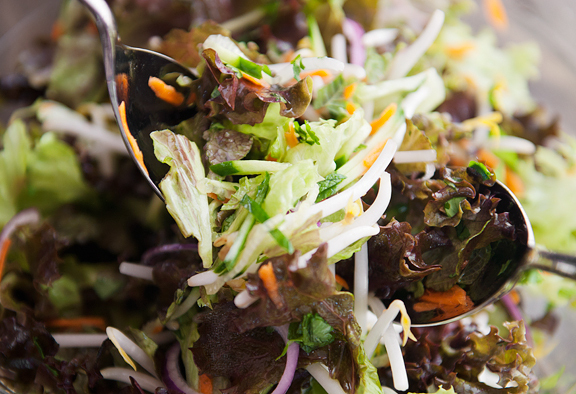 The recipe I referenced is a spicier version with raw Thai bird chiles tossed into the salad. I omitted the chiles from the salad, although I have a couple in the dressing to infuse some heat. Those are eventually strained out, but I say do what appeals to you. It’s all good. 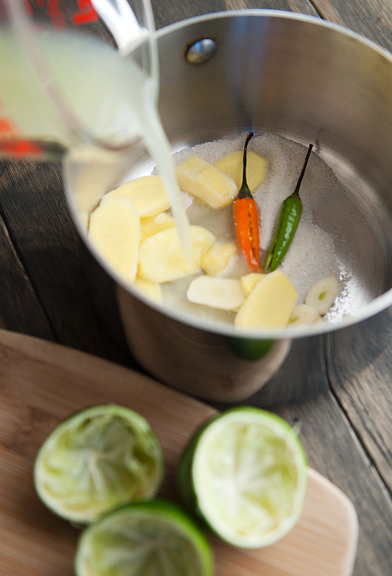 Make the dressing first: Place the lime juice, fish sauce, sugar, chile, ginger, and garlic in a small saucepan. Stir over high heat until the sugar dissolves. Bring to boil for a minute then remove the dressing from the heat. Strain the dressing and discard the solids. Set aside and let cool. *Note: If the lettuce is wet, the water can dilute the dressing, in which case I recommend doubling the dressing. Or if you prefer your salad dressing to be stronger, double the dressing recipe. 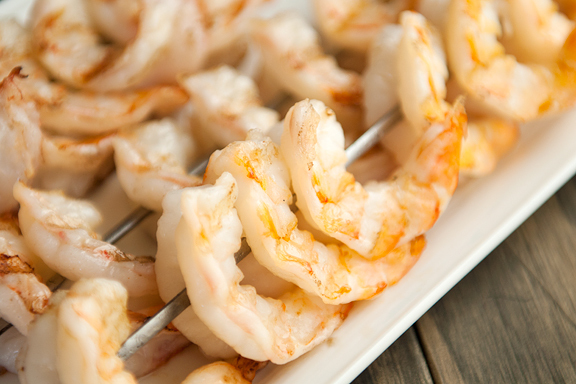 Skewer the shrimp onto metal or bamboo skewers and brush with vegetable oil or butter. [I ran out of oil, so I used butter and it was awesome.] 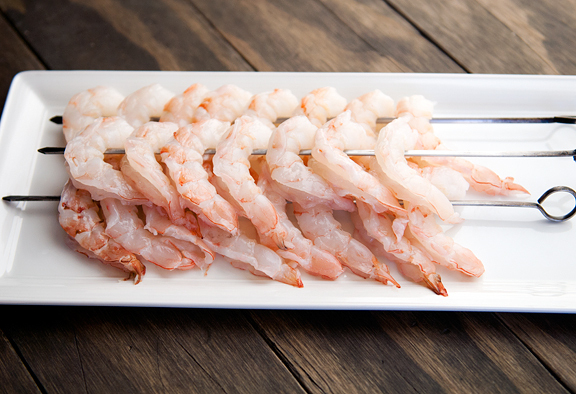 Grill the shrimp over high heat for 2 minutes, then turn the skewers over and let grill for another 2 minutes. Remove from heat and carefully unskewer the shrimp. 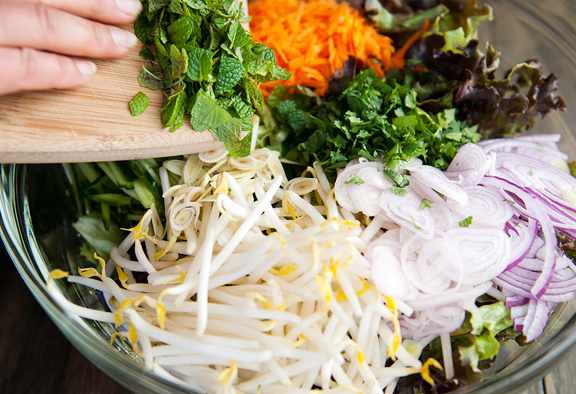 Place the lettuce, shallots, red onions, cilantro, mint, lemon grass, cucumbers, carrots, and bean sprouts in a large serving bowl. Pour the dressing over the vegetables and toss to mix everything together. 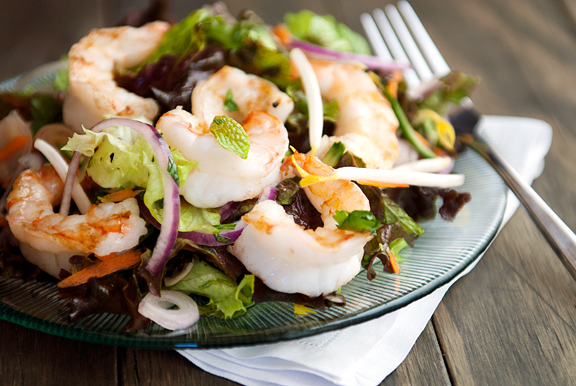 You can serve the shrimp on a bed of salad or toss the shrimp in with the salad. Serves 4-6. You are so great! I love that you are a science nerd, amazing outdoor woman, in love with CO, and eat fabulous food (with real butter). I’m probably not allowed to say I feel like a kindred spirit – because we’ve never met! – but it’s true. Thanks for your continuing awesome blog. 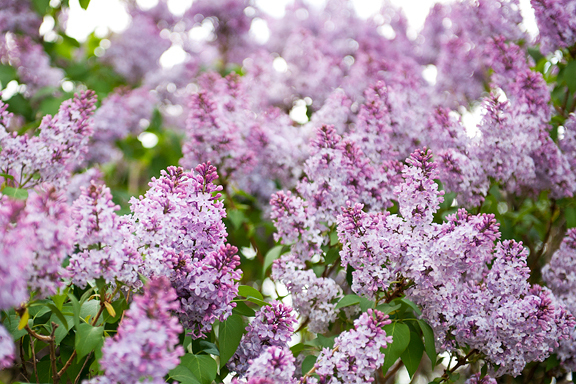 And don’t forget to appreciate the scent of those beautiful lilacs, even if they are way too early. 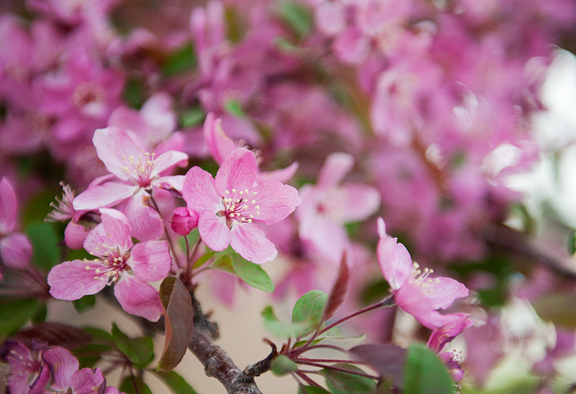 Looks like a crab apple blossom to me. This salad looks so good! I’m glad I have leftover vermicelli with pork salad in the fridge from my favorite Vietnamese restaurant. And even though the season is much farther ahead than I want it to be, I’m glad some of my mint is up so I can add some to my leftovers! I feel exactly the same about the weather! I was born and raised in CA and lived there until I was 37. Then I moved to Houston, of all places! Even hotter! My boyfriend and I are dreaming of moving to Colorado because we are so, so tired of hot, hotter and hottest all year long. Your pictures and stories make me want to be there even more! Winter has come about 3 months too late in Southern California. We had snow on the mountains in Pasadena this weekend. In fact, I think I posted the opposite rant. I am ready for sunshine! i have to say, your knife skills are just fantastic. every time you post something with a lot of chopping, i am always arrested by how even everything is. this salad looks absolutely fantastic. Congratulations on being interviewed in Science Magazine though!! That is spectacular. & I love this recipe! I will have to try it out for myself one day. I made this tonight – it was fabulous, but there was no where close to enough dressing. I’ll double the recipe for the dressing next time. I was looking for something with great flavor yet light to make for Mother’s day…this is it!!! Maybe I’ll dig out the ice cream maker and go all out with almond ice cream and green tea cookies! Love the flavors in this. 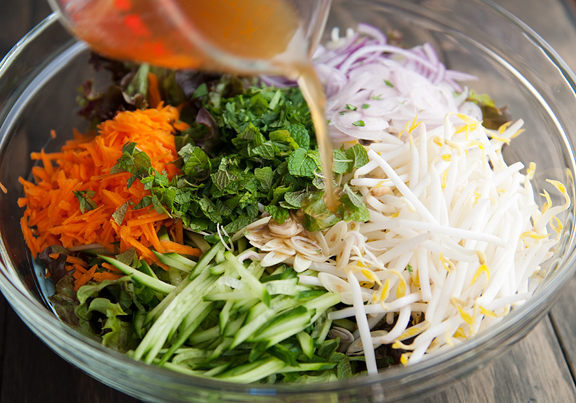 I’ve made something similar – a Vietnamese spring roll salad but it was without lemongrass – will have to try this! I love your comment about you love summer, just not 6 months of it – that’s how I feel in the northeast here (Rochester NY, we might get about 100 days of sunshine here?) where we got completely robbed of our winter. I just said this morning to a friend “I really miss the winter we never got,” and got a perplexed look. Ahh no one gets the winter lovers. However, I’m ready to cook this awesome looking salad, thank you! Think I could have written the same post as Twila. You worried about putting butter on the shrimp? Surely you jest. I’m digging the amazing lilacs blooming around Boulder right now. Thank you for the photos of them. You’ve really captured the “smell” of the season with that snapshot. oh…and this latest recipe? To die for! Kristin – ah, thanks. I don’t know my flowering trees at all. Kate – I heard about that snow storm. We were hoping to catch some of it as it passed East, but we only got a few inches. Bummer. Jackie – ha ha! Thanks, you’re too kind! Tiff – I used to live in the valley and I would have to say hot and hotter (70 is pretty hot to me). There were lovely days when it would rain or when the inversion layer would keep the sun at bay, but oh man… too much heat for me. Lisa – ah, that can be a problem (the dressing) when the lettuce is wet. I find the water dilutes the dressing like crazy. But sure, some folks may prefer more dressing. I’ll edit that. Carla – thanks! I hope you enjoy it. Vicky – yes, I really love all of these SE Asian flavors too. So much going on and it’s all awesome. 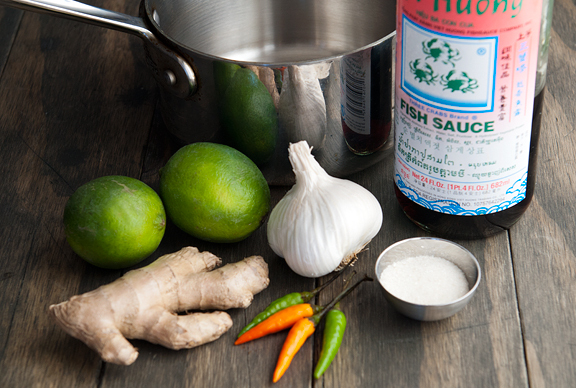 JulieT – I just wasn’t sure how it would go with the fish sauce. Love the colors. It really does look amazing and very tasty. Can’t wait to make this recipe. I made this last night! 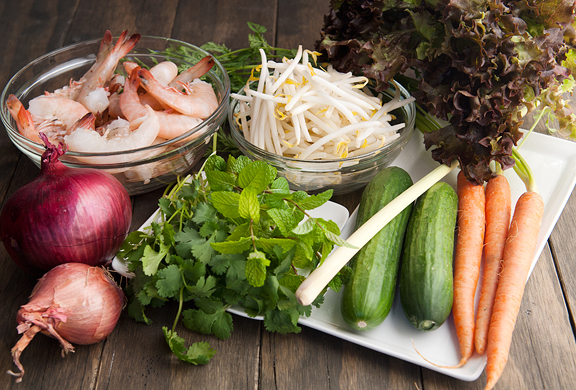 My husband is always skeptical of salads and doesn’t usually care for Thai food, but the awesome dressing and vast quantity of shrimp won him over. (Seriously, he’s a changed man :-). Thanks for the terrific additions to my recipe collection. We served this with rice seasoned with lemon, ginger, and tumeric. While not traditional, it was tasty.